Every year, dozens of students (and parents) contact us for advice on how to get into Harvard. 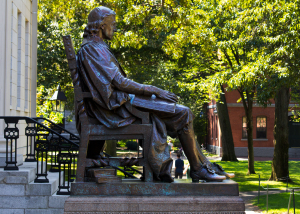 And in each case, we stress that there is no magical, prescribed formula for earning a Harvard acceptance letter, and that application strategies will depend largely on the basis of each student’s background, achievements, and college-related interests. That said, there are a few general rules that all Harvard applicants should follow in order to maximize their chances of securing a spot at America's most prestigious institution. In general, Harvard gives serious consideration to students earning top grades in the most rigorous curriculum made available to them—the majority of admitted students have earned mostly or all A’s in a program of study replete with AP, IB, and/or other advanced courses, often nabbing valedictorian or salutatorian status in the process. Outside the classroom, successful applicants have devoted substantial time to at least 2-3 extracurricular activities, assuming leadership roles and typically earning awards at the state and national-level. They also put together applications that effectively showcase their authenticity, potential contributions as a college student, and fit with Harvard’s offerings. Of course, being an athlete, legacy, or underrepresented minority can help; but even if you’re a star basketball player with excellent grades and test scores, a stellar extracurricular resume, and two parents who previously attended Harvard, there are NO guarantees. Each year, Harvard receives applications from many more qualified students than they are able to admit, which means that uncontrollable circumstances and arbitrary decisions lead to the rejection of students who would have earned admission the year before or the year after. As such, instead of asking how to get into Harvard, students should be focused on identifying several additional colleges that are capable of offering an equally or more rewarding undergraduate experience. In the past decade, College Transitions admissions consultants have helped more than 30 students earn admission into Harvard; yet nearly half of these Harvard admits decided to attend elsewhere after thinking “big picture” about their college plans and after ultimately deciding that another institution could more effectively meet their college-related needs and/or allow them to more effectively pursue their academic and career interests. College Transitions counselors can maximize your admission prospects at America’s most competitive colleges and universities, but more importantly, we provide you with the knowledge, tools, and confidence to identify and succeed at a college that is right for you. Many of our students want to know how to get into Harvard--some eventually attend; yet all ultimately realize that there are more important college-related questions than, “How do I get into Harvard?” To find out how we can contribute to your college success—at Harvard and other selective institutions—please contact us at 706.389.9936 or at info@collegetransitions.com. We also encourage you to visit our website to learn more about our background, services, and results, or to request a free consultation.